Like Daly, [Transbay project manager Emilio Cruz] questioned the assertion by representatives of the California High Speed Rail Authority that the station needs to accommodate so many trains. Only Tokyo - a city of more than 12 million people, or nearly 15 times larger than San Francisco - has a station that accommodates more high-speed rail service than the authority proposes. But even in that worst-case scenario, combining the CHSRA’s ridership projections with its new alleged need for increased peak capacity, the trains would only be 12-43% full at the newly increased service levels. Note that there are still other design options that were once considered — including tail tracks and an underground track loop — which would improve the flow of trains in and out of the station. And in the long, long, term, beyond 2030? An additional tube under the Bay has long been discussed in hushed tones, even though it is not yet being planned outright. If an additional tube contained four tracks (with two broad gauge tracks for BART, and two standard gauge tracks for intercity and high-speed rail), it would dramatically increase pinched transbay capacity. It would open up new possibilities for regional connectivity, and it would finally integrate Oakland and the East Bay directly into the state’s high-speed rail network. It would also mean that trains would run through Transbay, rather than terminating there, which would put less stress on that station. So is this really about CHSRA's desire to keep open the option of an extension across the bay to Oakland? If so, it could explain their lack of specificity on the plan for 12 trains an hour - why give ammunition to the Peninsula NIMBYs by holding out a transbay tube and a possible East Bay route that these NIMBYs could point to as a reason to kill HSR. That's blind speculation, of course. And we've seen worse suggested in the comments, that this is all somehow a Quentin Kopp effort to undermine the Transbay project for his own goals. I have always resisted the groundless conspiracy theories that some toss out there about Kopp, or Rod Diridon, or the CHSRA, and I continue to resist those here. But it must be said that such theories abound when there is a lack of information. The CHSRA needs to release its studies and reasoning that explains why they need a train box capable of handling 12 trains an hour so that we can give them open and honest discussion. That's to their benefit and ours as well. "I find myself on the same side as Gavin Newsom,” Sup. Chris Daly, who has long supported the Transbay project as a TJPA board member and regularly battles with Newsom. “We’re going to pull together San Francisco officials around this issue." Daly said he has had recent discussions with Newsom’s economic policy head Michael Cohen and with Newsom-aligned Sup. Sean Elsbernd, and they’re all on the same page. Why a train box? Boxes are ugly. This takes for granted the contention that the plan for four platforms is a four tph design. ... which raises the question of who is the expert source on rail operations that is advising that 1 train per hour per platform is the maximum that can be realistically expected? Ideally, two tail tracks would run directly off of an HSR platform each, with the other two each switching directly onto one tail track, and then the two tail tracks cross-switched. But even without that modification, what in the design envelope of the Transbay Terminal train box could plausibly force platform dwell times of an hour? I fear that the fact that the HSR will be taking over market share from air travel has confused some into a stereotype of "running trains like they are planes". However, the market share capture occurs not by running trains as planes, but by running top rate trains, which can leverage competitive advantages that trains do not possess. Not having to get all passengers into their seats and buckled in before "take off" from the platform is one of those competitive advantages. I apologize for sounding dumb but what is tph? trains per hour ... the whole debate is that four of the six platforms that can be put into a single level of the Transbay Terminal can only support four trains per hour, and the CAHSR wants a capacity of 12tph, therefore a second level (as substantial additional cost). First, 12tph seems a bit high, and second, 4 tph with four platforms seems like a deliberate under-estimate to try to frame the debate. In the "2030 frequency map" posted in the Anaheim post, there is 27 trains in peak six hours, one way, SF / SJ / LA / SD ... that is 4.5 trains per hour, or more likely five tph peak, and four tph in the shoulder. A departure every 12 minutes. !!! If that is with single level, single set stock, go to bi-level full length trains, and you drop down to 3 tph in service of that route. Indeed, reach that frequency, and you are certainly drawing sufficient patronage from sufficient distinct parts of SF that a secondary terminus would likely reduce total local transport required to access the system. Of course, declare that four platforms can cope with 8tph, and set a design target that the main SF terminus should support 8 HSR tph, and there is suddenly no longer a controversy, hence the conspiracy theories about the controversy. Tokyo Station has 3 platforms / 6 tracks for the Tokaido shinkansen. They handle up to 15 trains per hour in the AM and PM peaks. There aren't even any tail tracks there, and there are no run-through trains either since there is no track connection between the Tokaido and Tohoku shinkansen (Tohoku is 50hz whereas Tokaido is 60hz). All they have to do is to bring in some operations managers from JR to show them how to run a station. I would just like to clear up 4 HSR platforms or HSR tracks because I have heard both. Doesn't 4 HSR platforms= 8 tracks? I've heard 1 Caltrain platform= 2 tracks. So basically my question is: How many platforms are planned, for which service (HSR/Caltrain) and how many corresponding tracks per platform per service. My opinion is that the current design of the SFTT should be left alone. We have already talked exhaustively about how the tail tracks can be used to provision the trains without taking up platforms. The tail tracks combined with bilevel double-length trains (if demand requires this much capacity) will be able to be served by the current design. I would say that Caltrain may run into problems with their minimal capacity, but they have the option of terminating some trains at 4th & King while this is not a real viable option for HSR. And if the ridership of HSR does go through the roof in California (I think I'm correct in saying everyone here does) and more capacity is desperately needed (even after bilevel extra long trains) then they can construct a new train box. The fact is is that the TBJA isn't going to get the estimated $1 billion for the double deck train box, they haven't even secured the funds for the current design. OK so I misread the Tokyo Station schedule - not all trains run every day. The most that they have departing in one single hour from the 3 island platform / 6 track configuration is 13 trains. (Sat. 5/2 is the day I chose - Golden Week, which is a major holiday in Japan). That's actually about 2.16 TPH per track. That rate would mean 8 or 9 trains per hour from Transbay Terminal's 2 platform / 4 track configuration, even in the absence of tail tracks. First, somebody convince me that 8-9 tph is not enough. Then, somebody convince me that the desired departure rate can't be accommodated by adding tail tracks to whatever system the Japanese use at Tokyo. I'm going to be honest here, ALL the proposed HSR stations look WAY too Airport-like. I mean, honestly, 10 concrete platforms covered by a glass roof? Too generic. In some cases, these "stations" will clash with the architecture of the current station it will be built upon (e.g. Los Angeles Union Station, San Jose-Diridon). Whose idea was it to make ALL stations uniformly alike? I suggest getting some designers to design unique-looking stations that fit the city their in. Both exterior AND interior. It may add more to the cost, but it'll be better than looking at a quaint mission-like building dominated by a futuristic-looking spaceship millennium glass monster. have we considered that the tph estimate includes trains that have destinations outside of california's planned system? ian: as it stands now, HSR is being designed as an island, with no possibility of through-running trains outside the system. Partly, this is because of FRA regulations that prohibit any reasonable HSR train from the main rail network, but regulations can be changed, and HSRA has shown no sign of wanting to do so. Another problem with using SF as a terminal for more services is that it's a peninsula, and the only rail access is from the south. So for trips to Vancouver or even Sacramento, it makes more sense to start from Oakland. There's a possibility of rail service to the coast line (the so-called Coast Daylight), but that would use diesel locomotives, and unless an engine change is organized in San Jose, would have to terminate at the existing 4th/King station. I am having a hard time believing that we are going to shoehorn the terminus for the nation’s first high speed rail line into the basement of a bus station in one of the most beautiful cities in America. The CalTrain commuters may want to get to the financial district, but our high speed train should ARRIVE at a centrally located and iconic Grand Central Station. Go to Google images and type in train station, we should have one of these! Have we really looked at the differences between these locations. It’s not just the significant matter of 2 billion dollars to go a few blocks, but where do the passengers want to arrive. • Multiple sharp turns will place restrictions on train design. What will San Francisco look like in 20, 30, 50 years. All the development is going on closer to 4th/Townsend, not the TBTT. If money is no object, then build a simple train box for CalTrain/HSR but leave the main station at 4th and Townsend. I would argue that 4th/Townsend is the better location. 4th & Townsend is not within walking distance of BART, only the single most important connecting transit service for HSR. Each BART train equals at least 10 buses in terms of capacity. Folks in SF need to wake up and smell the coffee: it's not just about getting people to their fair city, it's now about getting them through as well. Many East Bay residents who want to catch an HSR train will do so in SF, so success depends on making the transfer from BART to HSR as fast and convenient as possible. The bottleneck in the BART system isn't the transbay tube, it's rush hour pedestrian flow capacity at the Embarcadero and Montgomery stations. HSR would exacerbate that if trains run to the Transbay Terminal because those are the two stations closest to it. a) add side platforms with long ramps featuring moving sidewalks up to the planned pedestrian tunnel under Fremont and Front Streets so BART trains can open doors on both sides at these stations. b) encourage commercial property developers to choose locations served by Powell and Civic Center BART. The latter would be greatly facilitated by siting a new Central Railway Station at Market & 7th, though the city would need to refocus on dealing with the social issues in the Ternderloin district. Regional buses could easily serve that location instead of or in addition to the Transbay Terminal, which would then become a much less grandiose affair or be canceled altogether. In any event, the notion that HSR needs capacity for 12tph is derived directly from the desire to max out the line before maxing out any given station. As we've discussed before in this blog, even the current 4 platform track + 2 tail track design would be enough to support 12tph, provided that turnaround time is brought down from 1 hour to 30 minutes - which would be entirely doable with appropriate operations planning. However, it makes no sense to push the infrastructure that hard, ever, because of brittle logistics considerations. Nothing ever works perfectly all the time, so as an operator, you want some buffer time to recover, e.g. when a train arrives late or there is a mechanical malfunction. If HSR really does become as popular as Mehdi Morshed believes it will, operators will use longer, bi-level trains and simply terminate some of them in San Jose or else in Millbrae/SFO (depends on where HSR will have its overflow yard, Santa Clara or Brisbane). The hard part is building ridership up to that level to begin with. There may also be HSR service up to Oakland long before a second transbay tube is built. Specifically, iff FRA gets a clue and UPRR installs interoperable PTC equipment, then it should be possible to replace part of the Amtrak CC service with non-compliant bullet trains running at 110mph where possible. There would need to be some double-tracking and some curves in Fremont might have to be eased. An underground shortcut between Oakland JLS and Emeryville via Mandela Pkwy might be needed to create an intermodal with BART in West Oakland. The reason planners are not thinking in these terms is because cities and counties are jealously guarding their turf, as are transit agencies funded by those counties. HSR only works well at statewide distances, but the state of California is a mess because of the 2/3 budget rule, so it has little clout in these matters. Moreover, Mehdi Morshed is a civil engineer with zero experience in high-volume passenger railroad operations. Parsons Brinkerhoff et al will always advise him to maximize the amount of concrete poured. Result: CHSRA will likely end up with a solution it (incorrectly, IMHO) considers inadequate and waaaay too expensive, just because the city of SF decided to build its new multi-modal transit hub in a location that is not already served by any of the existing rail-based transit services nor easily reached by HSR. Extra, extra: tail wags dog! Rails are the least flexible component of the equation. Bus terminals and, given time, even real estate development can be re-located far more easily. I believe you are replying to the wrong person. You reply to Mike, but the subject matter of the reply appears to be for Grand Central Station. You would think that before spending that amount of money that they would look at a third option. The third option being to design a station that meets the lesser ridership totals, but could be expanded to support more trains if that become necessary at some point in the future. In other words, design the initial station without closing the door on the possibility that you would expand it. A couple of the newer freeways built here in SoCal had their overpasses and underpasses built wide enough to support more lanes than they poured. Expanding the lanes sometime in the future is just a matter of pouring concrete. And whenever they do major freeway construction, they always leave the current lanes open, focusing most of the work during non rush hour times. I don't know if that would be applicable to the building of the train box in question, I'll leave that to the experts. If a two level train box is the final configuration, then maybe the option would be to dig the box deep enough for both levels, but only use the lower level? It may be that that represents 80-90% of the total cost, in which case there wouldn't be much savings versus just building both levels out at the same time. your presumption is that there is a potential capacity problem to begin with. There isn't, it's a ploy CHSRA is using to get out from under having to foot a bill that is much larger than it had bargained for. Good morning, I was looking forward to your reply. I am in total agreement that BART is the single most important feeder for CAHSR. As I understand it though, there is no connection between BART and TBTT except a quarter mile aboveground sidewalk. Since these are travelers and not commuters, luggage is a deal breaker for that distance. If I wanted to connect with CAHSR from the East Bay where I live I would do it at Millbrae, and then at San Jose if and when BART finally gets there. How would you rate the importance of direct MUNI access, direct 280 access, the bigger piece of land, etc. Maybe you could give us some more details on the TBTT? Are there plans for an easier connection to BART on Market St? Are there still plans for a MUNI streetcar line that deadends at TBTT? Has there been a similar problem in Spain, France, etc. O..to have a station like the new Berlin Central Crossing..now thats worth 4 billion. 12 trains per hour is ridiculous. It would be decades before that kind of ridership would be reached and this CAHSR nonsense is going to screw up our new transbay terminal project. I just watched the the transbay board on sfgtv and the public comment was " don't let the cahsr screw you around" they get a deadline to justify their request and if they don't meet that dead line and prove the numbers then jpa should proceed with the original plan and cahsr can take it or leave it. You have to keep in mind while here on the local level san franciscans know what they want and at the cahsr level they are a bunch of corrupt politicians who are too busy playing games. Screw em. We want our transbay project o move ahead as planned. if they don't like it they can go elsehwere. They are not going to put the city on the hook. To tell you the truth as much as I support hsr, i'm pretty fed up with the way they are screwing around. At this point I don't care if they go to tbt or not. They aren't going to get this project up and running anywhere near on schedule anyway. They don't know how, and they are more interested in politics and games than they are in making a good system for californians. jim: if only more people realized that before the election, because this outcome was entirely predictable. Why are they more interested in politics? Well, who's on the HSR board? Politicians mostly, and there isn't nearly enough of an internal bureaucracy in HSRA to counteract their influence. And no, they don't know how to build trains, and are missing some very important things, notably any work on interoperability and the regulatory framework, both of which are absolutely crucial to making this project work. Per current understanding I support CHSRA on this. The CHSRA is charged with planning, constructing, developing and operating a statewide HSR system. Per legisislative directive, the system shall enable headways as close as 5 minutes apart for each direction. 60 minutes divided by 5 minutes = 12 trains per hour. Or, tph. Again, that is the directive provided by our legislature upon the CHSRA. As for having the operating capability to enable 5 minute headways, or 12 tph, you not only need to look at the number of dwell locations (platforms), but also the ability and time requirements for trains to get in and out of the station and clear crossovers and switches. Each should review the diagram provided on the other blog, or diagrams on the Transbay Terminal web site. Exhibited is a cross section exhibiting 4 tracks and 3 center platforms. That infrastructure needs to accomodate Caltrain too. With that in mind I assume 1 platform and 2 tracks would be dedicated to Caltrain and the remainder to CHSRA; or 4 tracks and 2 platforms (for CHSRA). With this parameter in place that would mean a train can only occupy a platform (dwell location) and tracks from switch/crossovers for no more than 20 minutes maximum. We get there by simple math... 60 minutes divided by 12 trains and mulitiplied by 4 dwell locations (platform + approach tracks). Richard Mylark has the opinion that the first architects/engineers of the Transbay Terminal designed it with the least amount of flexibility and assumed the lowest speeds possible. I am not an expert in those matters; however, I have some experience there and I couldn't disagree. I see tight turns and limited track capacity. The point that should not be overlooked is the travel time from the mainline track into a dedicated dwell spot. In some instances that will require an inbound train to crossover the opposite running mainline and the leads to 2 other leads into other dwell locations/platforms before the final lead is entered. Additionally, once that final lead is entered into... it takes time to unblock the mainline, the other leads, and complete the entrance to the final dwell spot. We know the platforms will be approximately 1200 feet long; basically a quarter-mile! And what is the distance between the mainline and the entrance to the platform/dwell location? ... probably another quarter mile. My back of the envelope estimate is that a train will need to travel approximately 1/2-mile minimum... and while doing so block other inbound or outbound trains and block their usage... and do so at a much reduced speed. For shits & giggles lets assume a train is reduced in speed to 5 mph. I could be over-estimating the speed! However, at that speed it would take 6 minutes to get off the mainline and come to a full stop at the final dwell location + platform. Add another 6 minutes for the departure maneuver... and you get no less than 12 minutes tieing up a platform. That leaves 8 minutes to get riders off the train and new riders to board the train. And, that ignores an operating margin... a margin that allows for various kinks and unplanned events to mess with the schedule. If my planning assumptions/parameters are correct, or even close... there is no way I can be convinced that there is enough time or flexibility to permit 12 tph operations under the proposed design. Proper planning would tell me to design for twice the size of planned operations... which is similar to what Morhead Morshedi (sp?) has indicated. This tells me that the Transbay designers should go back to the drawing board and come up with something different. I don't think the CHSR Authority should accept anything less if the statewide system is to serve the TBT... for doing so would cap the operating abilities throughout the state. Each should review the diagram provided on the other blog, or diagrams on the Transbay Terminal web site. Exhibited is a cross section exhibiting 6 tracks and 3 center platforms. @Brandon, the TTC station throat ends 1150 m from the track buffers. Only about a third of that is the platform itself. not some far off future event the station that for all intents was for Caltrain might now be to small. I hope that a loop options solves any issues or maby squeeze in one more platform and set of tracks.I think the 50-100 year bit is over kill. future officals might not even want this location that far out. ^^^ If that 1,150 meters is the total distance a train must tavel at reduced speed, while blocking other platform leads, that is about 50% longer than I had estimated. Therefore, assuming trains are still running on avg at 5mph into and out of that section... we're talking approximately 18 minutes dedicated to maneuvering trains.... leaving 2 minutes for an operating margin and movement of riders. the only BART-friendly feature that is planned, and then only as an option, is a pedestrian passage underneath Fremont St out to Market St. It's not 100% clear if it would really extend under Market to the other side (Front St), that would obviously be useful. It's also not clear if there would be moving walkways in that passage, given the distance there ought to be. Even more useful would be sloped moving walkways underneath the sidewalks on Market St that would reach new side platforms at Embarcadero BART. Provided that the trains come to a stop very near to a prescribed target location, passengers could then alight/board on both sides of the trains. However, while this would greatly improve connectivity between BART and HSR/Caltrain, it's still not comparable with simply running tracks straight down 7th to meet BART at Civic Center. (a) there's more than one way to read AB3034. The line should of course support 5 minute headways, in other countries operators push the envelope and go as low as 3 minutes in the slower sections. However, given the layout of the whole network, the section that will require that capacity is Chowchilla-Redondo Junction (roughly, Fresno - LA). It makes no sense to engineer the station in SF to 12tph if there is no realistic scenario in which that load will ever materialize - especially given the suboptimal connections of the Transbay Terminal location to BART, SF Muni and the streetcars. Buses alone are not going to bring in enough passengers and there won't be much in the way of parking in the area because of the TOD. Starting out with a bus depot that you happen to have and somehow cajoling 5 rail-based services to reach it is the very definition of tail wags dog. Creating a multimodal transit hub for SF is a fabulous idea. Doing so at that location is anything but. Headway regulates time separation between services, so it certainly does set an outer limit on the feasible number of services. The 5 minute headways therefore implies that no political demands can be made for any more than 12tph, no matter what. But the guaranteed minimum time separation between services does not extend to a guarantee of an ability to turn-around trains to push the headways to its maximum over the course of a full hour. The second part ... the headway says that it has to be possible for 4 trains to arrive and 4 trains to depart in 20 minutes ... which means that any cross-system bottlenecks can only be occupied for 2.5 minutes, total, safety margin included. If the safety margin was 2 minutes, that would be a minimum of 60mph (to clear in .5 min), if the safety margin was 1 minute, that would be a minimum of 10 mph. Avoiding that means avoiding cross-system bottlenecks or imposing operating constraints. OTOH, imposing operating constraints is likely to be penny wise and dollar foolish, since placing restrictions on which order platforms can be accessed is likely to increase dwell times. One way to avoid cross-system bottlenecks is dedicated disembarkation and embarkation platforms with movement between the two by tail track ... then only the Caltrain services would have to cross-over the main line. If the most serious problem with the TBT design is the delays in accessing the platform tracks ... that would seem to be a better public issue to raise of attack than the 12 High Speed trains per hour line of argument, since "the design slows down the High Speed Rail" is something that gets its message through pretty much as soon as it is heard. On a sidenote, note that Caltrain may be platform 1 on the first island and platform 6 on the third island, with HSR in platform 2 on the first island, platforms 3 and 4 on the second island, and platform 5 on the third island. it's my understanding as well that Caltrain will be getting the outermost platform tracks since those are the most severely curved. Caltrain consists are likley to be shorter, to that matters less for them. Pedestrian congestion on the platforms can be avoided by restricting when those waiting to board are allowed to descend from the concourse level. If Homeland Security insists on metal detectors and X-ray machines for carry-on baggage (there is no other kind), then that will have to be dealt with on the concourse level anyhow. I haven't seen any plans for how that level will be organized, but if security/capacity issues at the platform level force operators to create assembly/waiting areas for HSR, perhaps even Caltrain, passengers on the concourse level, some attention needs to be paid to how pedestrian get across the building to the right queue. Emergency evacuation also needs to be looked at, you can't afford a bottleneck there. As for the trains, the throat and the access to the tail tracks could be bottlenecks, e.g. for full-length (400m) trains. With proper pedestrian flow management, it should be possible to ensure that no passengers are anywhere near the trains when they enter through the throat, so somewhat elevated speeds through there should be possible (e.g. 25mph). Departing trains won't be as fast. Note that the current DTX tunnel design calls for three tracks, I'm not sure how they were supposed to be split between Caltrain and HSR. Considering that Caltrain will need to operate higher tph count with fewer platform tracks, there is arguably a case for giving it two tunnel tracks and HSR just one, even if that means some HSR trains will be stuck out at 4th & King at times. An alternate approach is to make do with two tunnel tracks and have both services share them, at 3 minute headways (plenty for average speeds of 25mph) two tracks could support a total of 20tph. For the money saved, I'd suggest a two-stage forking of the tracks in the throat, first into two groups of three and then into the individual tracks. Some additional run length may be required, which would imply moving the middle section of the tunnel from 2nd to 3rd Street - a very much non-trivial change, given the location of the fancy MOMA (Museum of Modern Art). Running out to 7th underneath Minna would be difficult, too, because of the Yerba Buena Gardens complex. It would probably be easier to rip open Embarcadero and put Caltrain/HSR tracks underneath the SF Muni tracks, one at a time (so Muni can maintain limited operations). Tracks would then go up Main to enter the Transbay Terminal from the east, with straight tail tracks under Minna and/or Natoma. All this just goes to show that tunnel construction would be a whole lot easier with a straight shot down 7th to Market/Civic Center BART. A bunch of buildings north of Harrison and east of Rausch would be subject to eminent domain for a Central Station there, but the design could feature as many full-length underground tracks as Caltrain and HSR desire: 8, 10, 12 - no problem, no need for tail tracks. The air rights above would then be sold to commercial and residential property developers and the surface streets restored. I had envisioned it with as an elevated approach rather than an underground one, and all though the existing Caltrain track geometry makes for a straight shot up 7th, it also puts either the brand-spanking new Federal Office Building or the century-old US Court of Appeals in the path of the station. It would be better to shunt the tracks over to 8th at some point and put the station at 8th and Market. That location would also be a bit closer to the actual BART platforms. The more I consider it, the more I think TBT should be scrapped. Brandon made a very good point. I had been openly mocking the 12tph requirement, but if Kopp is mandated to seek capacity for 12tph, then Kopp is mandated to seek capacity for 12tph. Was that from a resolution or is that part of the language in 1A? If it's binding legislation... dear God. If that's the case, the idea of being open to running some trains to 4th/King isn't necessarily a bad idea - that may give CAHSRA the ability to say "we've secured our mandate of 12tph" without actually having to implement it. Having said that, once Caltrain moves to the TBT, what is going to happen to the 4th/King terminal? Will it continue to exist, or will it be redeveloped? As far as Caltrain goes, stopping at both 4th/King and TBT is probably undesirable, and I have absolutely zero knowledge as to just how Caltrain will be brought underground. Yes, all of the development is going on towards Mission Bay, but the transportation is not there, and Muni is going to have a nightmare on their hands if the N-Judah and T-Third become a CAHSRA shuttle - those two lines are already in deep enough doggy doo-doo as it is. Its not the passenger operations side, its the train access side. The political quandary that y'all face is whether to work to patch it or fight it and risk it going ahead unpatched. * P:6 -> access line, switches w/P:5. * All trains back into platform. @andrew while the idea of going up 7th to market sounds good. It can't happen. There is no where to build at 7th and market and or 8th an market. 7th has the fed and the court in the way and 8th is taken by the historic whitcomb hotel on one corner, the new public library across the street, the historic orpheum on the other corner and the 1900 unit trinity plaza project currently under construction on the fourth corner. Nor is there room at mission, howard or folsom. in addtion to that the entire neighborhood is under the western soma plan which has strict development limits, height limits and density limits in order to maintain the working class neighborhood and push back against gentrification forces. This neighborhood is being preserved for and by those of us who reside here. Besides its unliley that cahsr would bother. At this point terminating at 4th and townsend for millions less and no further burden to the city treasury, sounds like the best solution. if people are willing to go 30 minutes to sfo, then they can certainly find there way a few blocks to 4th. as for bart transfers. it makes sense at millbrae. as for muni the N and T serve 4th directly while no metro lines will serve the tbt. OT, but DoDo has a good one up at ET on HSR ridership on several european lines as well as a few asian ones, looking at the rate of ridership increase year over year, what worked and what didn't. worth checking out. I had my eye on the plain-looking building surrounded by a parking lot at the east corner of 8th and Market. Are you sure that`s where the Trinty Plaza`s going to go? A quick Google search for "Trinity Plaza" came up with the address 1118 Mission, which is a bit away from that. Regardless, I don`t think anyone in a position to make decisions about it is seriously going to consider a central railway station at 8th and Market. On the unwarranted extension from headways to station capacity ... maybe an example outside the present debate would help clear it up. Taking the 5 minute headways as a requirement to demand 12tph at any terminus also implies a 12tph terminus at Sacramento. The headway requirement sets an outer envelope for the whole system on the total trains that might arrive in the course of an hour. And a system designed to operate without any slack at all is subject to choatic and cascading failure. Therefore, a system-wide outer-envelope has to be larger than the operational target. On the other hand, if there have been no radical changes in the 2nd to Main TBT alignment since the EIS, its hard to see that design catering to 8 HSR tph as well as maintaining Caltrain services (never mind expanding them). I know that there is a common bargaining tactic to ask for more than you actually need, to have bargaining room. But in a multi-party negotiation, asking for more than you can plausibly need risks getting cut out of the deal altogether. Getting 8tph for HSR as well as room for expansion for Caltrain requires fixing the flawed rail access design. But the bottleneck there is the rail access ... a two-level train box to get more platforms without the ability to get trains into them and out of them is an obvious bit of concrete-plating. I highly recommend the Eurotrib article that wu ming linked to, it's a good look at ridership trends and how the compare with forecasts. And also has a good piece of data: the entire intercity rail network in Spain has a ridership of 23 million, of which half is AVE services. Just extrapolating this to California means that an HSR ridership of 10-20 million is much more reasonable than whatever HSRA is forecasting. It might also be the case that ridership ramps up very slowly, as people's travel habits change toward the new equilibrium, and this seems like a hard thing to predict as it's largely a cultural matter. To say that four tracks means only 4tph is ridiculous. Four tracks should be able to handle 8-10tph without difficulty. An important point: just because the CHRSA wants somethign capable of 12tph does not mean they think there will be a need for 12tph through out the day. Some commentators have been takeing the annual ridership and useing that to calculate the average hourly ridership, and then saying "12 tph is way more than needed". Travel by any mode tends to be concentrated on certain times of day, so that the busiest hour is much busier than the average (example: your local freeway). I woudl guess CHRSA have a daily ridership profile which impleis that certain times of the day will need 12tph. However, to give any credability to their demands, they *must* publish their methodology. It doesn't have to be a long report - something like this could done in a few pages. TomW, it is correct that there will be some bunching, but the main travel pair is served by two routes ... SF-SD/LA/Anaheim and SF-SJ/LA/SD. Put on an Express to SD and an Express to Anaheim, and you have two expresses that hour to LA. Put on a Local to SD and a Local to Anaheim, and you have two locals in that hour through the CV. Add a Sacramento service, a Semi-Express to Fresno and points south ... given the lifespan of the investment, certainly allow for a Las Vegas service and a Phoenix service ... I'm struggling to find the routes that need more than 8 trains, peak. A Rapid Rail sleeper from the Pacific Northwest, maybe? ... but that would terminating at Sacramento, transfering to either NoCal or SoCal HSR, unless there is a Rapid Rail path to use, in which case it would still have hefty transfers at Sacramento but also continue on the complemtary 110mph network, probably down the coast. Y'all need to get the original SF terminus as close to BART connections as possible, and you've pretty much screwed the pooch in terms of reserving good inter-regional / local rail connectivity, making it all the more important to actually provide the best half-assed connectivity you can get, which really looks like TBT. But if you have Express trains every half hour to LA and local trains every half hour through the CV, and wanted to add more services, then that connectivity is provided for, and you'd also want to spread the workload around to different parts of the regional local transport system with one or more secondary termini. TomW: freeway usage has the peaks it does because of commuters (Caltrain and BART have roughly the same peaks too). HSR is not a commuter system, and the ridership pattern is going to look rather different, probably more like the existing airplane ridership. Since the trip is a longer distance one, and not a commute, many riders will have much more flexibility in terms of when they travel, and it's likely that the ticket prices will encourage people to use off-peak service where possible. In any case, it's likely that there will be a base service of 1-2 tph throughout the service day. Staff from the Transbay Joint Powers Authority will provide an update on the progress of the program to extend the Caltrain rail alignment for Caltrain and California High Speed Rail to a new Transbay Transit Center in downtown San Francisco. Joining us will be Robert Beck and Bradford Townsend. 6 PM - 6:45 PM order your own meal, cafeteria style, at Panera Bread. We will be seated in the back area. the meeting sounds great anyone going? im off that day for medical - and have a planning commission meeting - then can go to this hsr meeting - very cool - who else is going? I read the 7ht & Market idea here, probably from one of your comments. Sorry I didn't credit you, I could not remember which post I had read it on first. 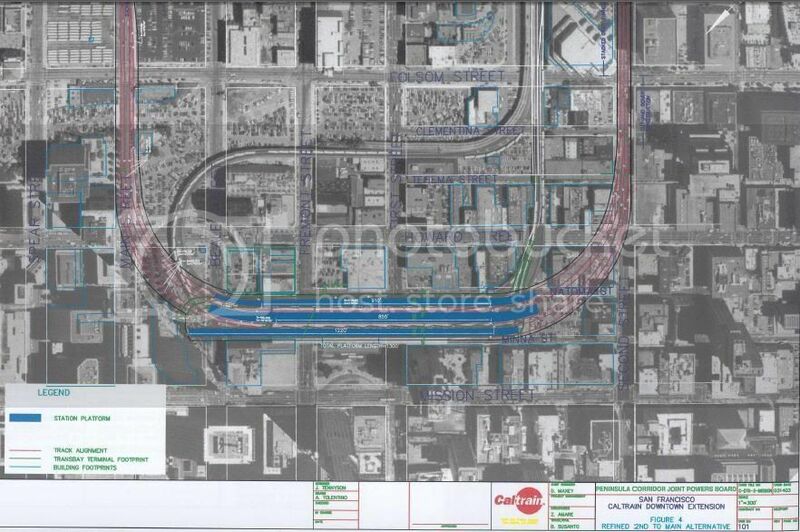 In any case, an elevate alignment looks impossible because the elevated I-80 freeway is in the way. Given height considerations, an underground station is pretty much the only option. Even for that, things are not quite as simple as they look on the map: the outfall of Mission Creek probably has to be crossed either at grade or well below it. The former option eliminates part of 7th, the latter introduces significant tunneling risks. As for the size of the station - the platforms for HSR need to be 1/4 mile long. That's roughly the distance between Howard and Market. In terms of width, you'd want 7th to Rausch, with the access tracks beginning at 7th and Folsom. That's quite a large area that would have to be demolished and later rebuilt. At this point I say just use the 4th and townsend as is with the basic imporvments and be done with it. lets get it built fast and cheap. there's no excuse for all the political jerking around. I'm really fed up already because instead of taking the post election clout to keep californians properly informed witha solid plan they have instead left everything up to speculation and conflicting media reports thus undermining support and jeopardizing the project. they ( the authority) need to be replaced with a team who can get the job done and stay out of the politics. Ill bet a paycheck that no train will run anywhere in the next ten years. But, arcady, note that SF is planned to be terminus of at least 3 routes, so 1-2tph translates directly into 3 to 6, not including specials and later extensions of the network ... eg, Vegas via a Mojave junction. It is therefore quite appropriate to require rail access system that allows 8 trains per hour to access 4 platforms. 12tph smells much more like an ambit claim. And demanding extra platforms when the bottleneck is access to the platform lines ... sounds very much like people who do not understand what the real priorities are. 50 per door ( 2 doors) or 33 per door ( 3 doors) no problem. bart and amtrak do it everyday in less than 5 minutes. trains arrive on platform 1, off board 5 mintues, dpeart to tail track, return to outbound platform 2 , board, 5 minutes, depart. there's no problem. That leaves no room for errors or problems. For one thing, I'm disabled, and while I try to board trains quickly, it sometimes takes a couple minutes to get the platform ramp to bridge the gap for the wheelchair. If I were on one of those rush hour trains, it wouldn't be boarded in 5 minutes. Maybe 10. Having said that, I'm in a wheelchair but move quickly. Some elderly people or folks with different disabilities may not be able to move as quickly. Having said that, I tend to think it's all academic unless there's a legal requirement for the 12tph, and if htere is such a requirement, I hope there's a way to read it liberally enough to make it irrelevant. Aaron: you should be really, really concerned with the platform-train interface. I think the only real solution is to have proper level boarding, where you can just roll your wheelchair right on the train (like on BART), with no stupid bridgeplates or lifts. BruceMcF: There aren't really three routes to SF. There's basically one route, with branches. It would be easy enough to just split the train at LA, with the front going to San Diego and the back to Orange County, for example. Or a cross-platform transfer. I can see 2 tph being a reasonable eventual level of service, with one local and one express per hour, and splitting at LA. Arcady: I'm a level boarding nut for local rapid transit, MBTA's Green Line was frankly no small part of why I left Boston - I couldn't cope with lifts being out of service all of the time, especially since they didn't have busses paralleling the B,C,D routes. It's also made me less apt to apply for attorney positions in Sacramento or San Diego. Having said that, while I don't want to see a Caltrain-style built-in lift, I'd be OK with a Metrolink/Amtrak style bridge plate, so long as it's clearly designated where wheelchairs can board, and they have clear procedures to do it quickly - I am so sick of having to sprint at top speed down the platforms looking for the boarding area. I don't know too much about the methods of design and construction, but I had the impression that it was extremely difficult for long-distance trains to have truly level boarding. Is that the case? You write based on the AVE numbers in my Eurotrib article that "Just extrapolating this to California means that an HSR ridership of 10-20 million is much more reasonable than whatever HSRA is forecasting." I beg to differ, for two main reasons. First, the magnitude of demand for high-speed rail traffic tends to be strongly correlated with the size of the largest city on the network, rather than total population. In Spain, that's Madrid and Barcelona, with little over 3 million. In France, the Paris region's 10 million ensures much higher traffic on all the radial lines -- just check the TGv Sud-Est and TGV Est numbers in my article. Seoul and Tokyo are beyond 20 million -- no wonder KTX and Shinkansens are well past TGV lines, too. Second, geography matters. Spain is a square country, with population centres all around, in need of a complex network (most of which is still in construction or on the drawing boards). However, you'll have a much stronger impact if all the main cities can be strung up on a single line, like in Japan or Taiwan. California has both of these advantages vs. Spain: the larger than Paris Greater LA center in addition to a Barcelona-sized and a Rome-sized one, and most of the population in a long and relatively narrow area. All in all, I think Taiwan may be the best analogy. But, on the other hand, for me to make up my mind: what are CAHSR's latest ridership expectations? Your fears about the difficulty of level boarding are legitimate, in Europe. Near every country in Europe has a different platform height standard, maybe multiple heights, making level boarding problematic for cross-border trains. HSR in California will be a new system built almost completely from scratch. I would consider a failure to provide level boarding a gross violation of the ADA. HSR will probably usher in level boarding for Caltrain, as well. Estimates range from 40-93 million passengers. Tokaido Shinkansen in Japan carries ~150 million passengers per year. That's not the whole shinkansen network, just the busiest line from Tokyo to Osaka by way of Nagoya. @ arcady: "BruceMcF: There aren't really three routes to SF. There's basically one route, with branches." Part of that is clearly a distinction without a difference ... Sacramento / SF is definitely a distinct service to SF / Anaheim. The SF-SJ / LA / Anaheim | SD exploder "solution" is not a general purpose solution. "It would be easy enough to just split the train at LA, with the front going to San Diego and the back to Orange County, for example." Its easier to run an Express to Anaheim and then, half an hour later, an Express to San Diego, and without the additional five minute wait added to whichever of the two is the trailing carriage, or the five minute plus wait northbound to whichever of the two is the leading carriage. And of course if the maximum combined patronage on two routes approaches one train per hour, so that two services per hour will be more than one full train, you still have two services, except with extra time penalties attached to whichever is the waiting half of the train. okay wait now - two platforms for hsr 12 departures per hour thats 6 departures per platform so thats and departure every 10 minutes, train arrives, people off, people on train departs. 5 minutes to offboard 5 minutes to board, not a problem. 400 people can board a train in 5 minutes. with no problem, In fact a 10 car train with 100 people per car ( 1000 passengers which will be rare on any one departure)"
They are island platforms, with two platform tracks per island ... so that is 10 minutes to debark, 10 minutes to embark, and off. And at a more plausible 8tph when the system builds out, 15 minutes to debark, 15 minutes to embark. So, no, its not the passenger access and egress that's the problem, its the train access and egress between the mainline and the platform tracks ... its a mess. And, of course, building addresses a bottleneck that is not in the design, and ignores a bottleneck that is in the design. wwell with the thru to tail tracks can 't the trains off board then slip down the tail track where the operator moves to the other end then pulls the train back in on the opposite side of the platform to board... they do this at muni embracadero station all the time, amtrak does it at jack london, and bart does it at richmond. here's the bottom line, and the supes and the mayor are on the same page as the citizens on this one, HSR can do whatever they want but we are building the tbt as planned and san francisco isn't paying for anything extra. take it or leave it or ca hsr can shell out the money. and if they think atherton is a problem, wiat till they try to jerk sf around. we don't play. Jim, how does reducing the dwell time at the platform get the trains through the tunnel quicker? ... well, how many Caltrains services per hour would it be if it happened to be the morning peak? Remember that the Caltrain schedules themselves have been made faster themselves by the electrification and the full grade separation, so even without Peak Oil effects, they'd be drawing more patronage. Now, there are crossing switches, but once you start crossing, then a single train movement blocks four or six platforms instead of just two ... and for trains the length of a full length HSR, moving at very slow speed because of the curves, it takes time to get the whole train over a switch, and if you are crossing over from the outside track to the inside track, all three tunnel tracks will be blocked for a noticeable period of time. So the "just run them at a faster speed through the tunnel" solution runs smack headlong into the tight curves in the design ... the only way that "shared bi-directional platform track with switches for contingencies" makes any sense is if the trains can clear the tunnel quickly, but the tight curves are the rail equivalent of speed bumps. Switch to a two track tunnel, an access line and an egress line (which also allows the curves to be eased), and put in a dive to eliminate track cross-overs in the fan-out at entry to the train box, and the access problems are sorted out ... 3 minute headways in the tunnels would accommodate 8 HSR trains per hour, 8 Caltrain trains per hour and an empty slot every 15 minutes for contingencies. BruceMcF: I sincerely hope that nobody take HSR from SF to Sacramento. Going via Gilroy makes this 90 mile trip into a 300 mile one, and running at 3 times the speed to match the travel time means you burn much more energy. So basically, it's about the same time-wise as taking the Capitol Corridor, but takes 5 times more energy. There might still be some benefit for intermediate markets, like San Jose to Modesto or Merced, but is that really enough? BruceMcF: if your terminal design is halfway decent, dwell time far outweighs the time that trains foul other tracks. Remember, we're talking about full HSR trains and passengers with luggage, and full Caltrains. You also need at least some schedule recovery time, given that it's a terminal, and if you have a busy service, it really, really helps to have the trains in the right order. A competent terminal design would basically use the same principle as Caltrain's current 4th/King layout does now: a set of crossovers some distance out from the station throat to provide a second crossing point and eliminate conflicts. Arcady: "if your terminal design is halfway decent, dwell time far outweighs the time that trains foul other tracks." I was about to say, "that would be your terminal design", but if Federal HSR money is going to be funding it in part, I guess it is my terminal design too. And, no, the access track design is not halfway decent. Its a cut rate design to avoid dives and switching in the tunnel by allowing each tunnel track to act as an extended island platform track shared between the two platform tracks of the island. A couple of dives, and its straightforward to have access tracks that can handle 8 HSR tph and 8 Caltrain tph with 4tph contingency either way, for peak transit or peak regional travel periods. And if the surface mainline has or is upgraded to 3 minute headways, that's about as fast as trains can be pumped into and out of the tunnel, so that would be a design that would justify requesting federal HSR money to help fund. For the original intention, a possible addition to the TBT to support Caltrain and maybe HSR and maximize the number of modes that powerpoint presentations could claim were being supported by the multi-model terminal, the original design may have been adequate. But its a lot more suited for supporting hypothetical HSR services than to supporting actual HSR services, so it has a lot better claim on hypothetical Federal HSR funds than on actual Federal HSR funds. Consider the "fully semi-parallel" use of the access lines. Each line used as alternating bi-directional track, dedicated to its pair of platform. One passenger-platform shadows its neighbor on the same island, but each pair is fully independent. The tunnel capacity used this would be 9 trains per hour if the tunnel is 1.5 miles, the average speed through the tunnel track is 10mph and the headways are 3 minutes. Paired-bi-directional is a way of increasing capacity on through track, but does not work for accessing a terminal platform through a slow access line because the platforms will be idle for the time required to clear the pair from the platform and get a new pair in. On the other hand, suppose that we start from the planned final allocation of platforms to services ... Caltrain to platform lines 1 and 6, HSR to platform lines 2 to 5, platform lines 2 to 5 more or less connected to a pair of tail tracks. OK, so dedicate the two outside tracks to egress and access, respectively. With 3 minute headways, that is a maximum throughput of 20tph, adequate for 8 HSR services and 8 Caltrains service per hour, plus 4 slots for contingencies. The Caltrain services are at platform lines 1 and 6 because of length restrictions on the extreme platforms because they are curved platforms ... but of course if the outer platforms are restricted to Caltrain services, they then have some length to spare. Use that to separate their platform tracks and dive them down to form their own own access/egress pair, which rise in turn between the main access and egress track. So, in essence, a stack of two-way track goes around the curve from the 2nd street tunnel. HSR trains arrive on the access track, and switch between platform lines 4 and 5. Passengers debark. The trains move to the tail track, restock, trash emptied, wait their turn to go to the departure platform lines 2 and 3, and depart on the egress line. At grade there is a cross-over switch for contingencies, P:3 begins the egress line with P:2 switched off of it, and P:4 terminates the access line with P:5 switched onto it. Highest capacity platform is with use of the tail tracks to split passenger access and egress, highest capacity tunnel access is with use of the tail tracks to split train access and egress ... so capacities are in sync. As a bonus, once the pair of Caltrain access lines have dived down to form the stack of access/egress pairs, the track can ease the turn radius substantially, easing that train-box access speed limit. As a partial financial compensation for the cost of the dive, after the second of the Caltrain access/egress pair rises and has been switched onto the egress track, the tunnel can narrow to two tracks at the start of the access tunnel. @ arcady: "A competent terminal design would basically use the same principle as Caltrain's current 4th/King layout does now: a set of crossovers some distance out from the station throat to provide a second crossing point and eliminate conflicts." Yes, an at-grade two island fan-out is a simpler scheduling problem than an at-grade three island fan-out. A single pair of cross-over switches and L:1 and L:2 are fully connected. Fully connecting L:1, L:2 and L:3 requires three pairs, and a crossover from L:1 to L:3 breaks the parallel use of L:2, so an at-grade three island fan-out has less capacity per island than a two-island fan-out. I haven't seen the scheduling scenarios done by the people who engineered the access tracks, but other parts of the design make it seem like the train box was an afterthought (for instance, the main structural support columns not spaced to the platform separations, so columns, escalators, elevators cannot be in the middle of islands), and if it was designed in 2003, I'm going to be skeptical whether they went to the trouble of actually providing adequate HSR capacity until I see someone walk through a complete train cycle. Will the three tracks in the DTX be bi-directional? Will trains both enter and exit on the same tracks (in the tunnel, not on the platforms)? Like in the DTX tunnel, it has tracks D1, D2, and D3. D1 to T1,T2; D2 to T3,T4; D3 to T5,T6? As long as San Francisco isn't paying for it. Now, there ought to be switches connecting them, allowing crossover closer to the platforms than the mouth of the tunnel, but I have not seen any switching diagram ... which doesn't isn't a publicly available one, just that I haven't seen it. @ jim ... it seemed more like San Francisco is going to be asking for Federal money to pay for part of it on the pretence that its an HSR terminal, despite the fact that its just planning to throw the HSR trains into the train box originally designed for Caltrain services and leave any problems that causes to be fixed at great expense and inconvenience at some later date. Well if tbt gets stimulus funds to help pay for the terminal thats great. and if cahsr get stimulus funds from the hsr 8 billion, they can use pat of that to so upgrades but san francisco taxpayers can't be expected to pay for enlarging the train box when approved the plan as is and the HSR said nothing about it. you know the city is intent on building the terminal per the original sked and budget. HSR should have said something up front when it was being designed instead of starting the political game playing the minute the polls close. HSr presented this project as though much of it was settled and ready to go and it turns out now that they don't have any idea what the details will be? Jim, I'm not talking about expanding the train box ... as I said above, given the freedom to optimize the use of the platforms, I think the 12 platforms are adequate. However, when the HSR system is built out, that is likely to be using the platforms more intensively than Caltrain were planning for when they did/commissioned the design in 2003. If they did the cheapest possible access design there is likely to be capacity constraints in accessing the train box. San Franciscans can, of course, just say, "take it or leave it", go ahead with the Caltrain-only terminus design, and tell CAHSRA that you'll make room for the Anaheim trains in Prop 1A and they can look elsewhere to terminate their other trains. But your state's budget processes interfere with getting support for region level infrastructure like a main northern terminus for the Caltrains services, so you are trying for Federal money on the pretext that the trainbox is the main northern terminus for HSR. That application ought to demonstrate the design capacity to serve as the main northern terminus for both systems with a substantial margin for growth. If it wants to have the best chance for success. Now, I've seen a diatribe written against the access design somewhere or other, which I cannot track back again (I came across it while looking for something else, of course), and looking at the Caltrain drawings in the 2003 EIS report, the diatribe sounds at the very least plausible. In order to minimize buildings taken out by the design, they put in very tight curves, which of course means operating at very low speed. And the simplest way to get close to parallel movement while cutting down on tunneling costs and reducing signaling infrastructure and maintenance costs is to merge platform tracks and extend the line straight through. For a single island, say P:1/P:2, P:1 arrives, P:2 leaves, when the egressing train has cleared, then the next train for P:2 arrives, P:1 leaves, and so on. At 10mph (it might be less, there are tight curves at both the tunnel entry and the train-box throat), and 3 minute headways, and a 1.3 mile tunnel, that's about 6 minutes per mile, or 11 minutes possession of the track per train, 22 minutes between arrival on P:1 and arrival on P:2, so the island can support 2.7 tph. Times three islands, 8tph. Get the headway down to 2 minutes, and its 20 minutes arrival to arrival, each island can support 3 tph, and its 9tph total. With the ability to use the tail tracks to park some trains between peaks, so during peak hour its possible to bring in trains, unload them, park them in the tail, you can easily expand that by 4 additional trains in one direction at any hour of your choosing. For the Caltrain services, 9tph through the day, 10tph inbound 7-8am, 12tph inbound 8-9 (and the reverse in the evening) ... that's substantial capacity to grow into, especially given that Caltrain has ample opportunity to grow capacity in each train. Which is why it is not at all implausible that they designed an access system that is not adequate for the role that would be the strongest basis for the application for funding. @Bruce I think the train box should be built up front and not after the fact. I also dont have a problem with doubling the size provided that the additional costs are covered by additional federal money. As far as the city putting out any additional money from its own budgets, can't happen. We are broke and slashing services right and left and people will throw a fit if they find out that services are being cut while the city is throwing money at tbt. That aside, Id say it makes most sense to get it all done right up front. If Federal money is being applied for to help build the box, which is reported as being the case, the design of the box needs to be workable as the main northern terminal for the HSR, and ideally as the main northern terminal for the Caltrain services as well. What to do if the funding is turned down is for San Francisco to work out. Only two Caltrain platforms for a main terminus is really straining credibility, and without open access to those two platforms, I reckon the credibility breaks. The simplest way to open access is, of course, a dive, which would be a deeper slot in the trainbox side cut and cover part of the rail tunnel. But it would be of interest to know the cost of a compromise two level, four platform track per level train box with the bottom shell built but not populated and access track to the bottom level deferred. With a decade to the launch of HSR, the access track to shift the Caltrain services to the lower deck and free up the upper deck to HSR would be and the passenger access, platforms, and platform track could all be deferred for quite a while, while Caltrain would be using the four platforms to be taken over by HSR, which would justify applying for HSR money to build it. And there would be no need for the access tunnel to be three tracks wide ... interconnecting an access and an egress track to four platforms is no problem, and the additional track to access the lower level can be done taken off to the side of the two main tracks. Indeed, on opening, a single island and tail track would be adequate for 4 tph up front for HSR, and if regional rail has quicker embark/debark, 6tph Caltrain, and then the access track, platforms, and passenger entry for the lower level of the box could be built even later when the capacity is required. It would also reduce the problem of the support columns being off center to the island platforms, since the platform layout could be a central island and two side platforms, with the "offcenter" columns at the back of the side platforms. ... why should it get any federal money out of funds allocated for rail? You know, this is going to be an utter disaster. This looks like the Terminal will probably go forward with no train box or an insufficient train box. Ow ow ow.